Angela Merkel won a fourth term as chancellor in Germany elections that lifted the far-right party Alternative for Germany into parliament for the first time since the immediate aftermath World War II. Merkel’s Christian Democrat-led bloc took 33% to defeat Martin Schulz’s Social Democrats, whose 20% is its worst result since the war, the exit polls for national broadcasters ARD and ZDF showed. The biggest winner was the 4-year-old Alternative for Germany, or AfD. It finished third after a campaign that centered on shrill criticism of Merkel and her decision in 2015 to allow large numbers of migrants into Germany, but also harnessed wider discontent with established politicians. 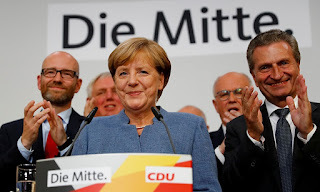 Final results released on 25th September showed Merkel's Christian Democratic Union and their Bavaria-only allies, the Christian Social Union, winning 33% of the vote, down from 41.5 percent four years ago. It was one of their weakest post-war showings.